In volcanology, diverse numerical models of conduit flow have been developed to relate the properties of these flows to processes that occur at the surface during eruptions. Conduit models incorporate varying degrees of complexity and account for the transport properties of magmas, steady-state or transient behavior, and conduit geometry (e.g., 1- to 1.5 D, variable width and erodable conduit walls). Improvement of these models is important if we are to work toward deployment of eruption models at active volcanoes, link these models to geophysical observations (seismic, deformation, gravity) and eventually forecast eruption magnitude. One conclusion of a recent comparison of many conduit models is that next generation models need to better account for interaction of the erupting mixture with surrounding wall rocks (accounting for melting, solidification, and erosion) and better account for the effects of conduit shape on flows. We made progress toward accounting for this interaction by using TLS to map basaltic conduits in a deeply eroded volcanic field, the San Rafael volcanic field, Utah. TLS data were collected with UNAVCO support during a field campaign in summer 2010. A region of approximately 1 x 1 km was imaged from 9 TLS stations. TLS data reveal the exact geometries of several exposed conduits, their relationship to sills and dikes, and dramatic change in reflectivity of the Entrada sandstone country rock with alteration. The TLS data are particularly good for (a) quantifying rapid change in conduit shape and area as a function of height, (b) differentiating breccias zones (complex mixing zones along conduit margins) from areas of late stage intrusion, (c) imaging complexity of sill geometry near conduits, illustrating the mechanical and perhaps geochemical interaction between sills and conduits in volcanic fields. Overall, application of TLS in this volcanic field has resulted in substantial improvement in our models of volcanic conduit formation, growth, and interaction with shallow magma storage systems. 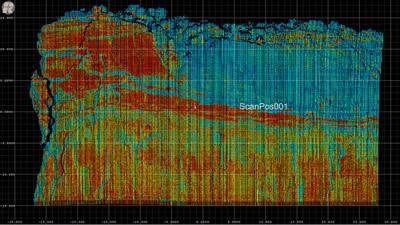 Figure 1 - TLS LiDAR point cloud from the San Rafael volcanic field study site in Utah. Points are colored by laser return intensity.